When I was little, our go-to recipe for birthdays and parties was a rich chocolate fudge cake from Josceline Dimbleby’s The Cook’s Companion. Delicious and fail-safe (even prepared by clumsy little hands), it was wonderfully adaptable; we’d often multiply or divide the ingredients to suit the number of guests, and the rich, fudgey sponge worked beautifully whether slathered in icing, dusted in sugar or simply on its own. As I got older, this wonderful tome also became introduction to a world of decorating beyond my existing repertoire of hundreds and thousands, candied lemon, silver balls and squiggles of lurid writing icing. The most exciting ‘recipe’ was one for chocolate leaves. You simply took a few veiny (non-poisonous) leaves from the garden or unsuspecting neighbour, painted the underside in melted chocolate then froze them, before peeling away the leaf to reveal a perfect replica. Magical aged seven, and still pretty fun now . . .
Fast-forward almost twenty years and I promised to make a birthday cake for my cousin’s 21st birthday. Chocolate biscuit for 50 people to be precise (eat your heart out Prince William). A biscuit cake isn’t the most beautiful of things to look at, so I had it in mind to tiers, iced to hide all the funny bumpy bits of biscuit, and thought I’d decorate it with some kind of edible thing. Chocolate leaves felt a bit old hat, and I wondered if I could try my hand at flowers. I first heard about cocoform watching an episode of Cake Boss. If you haven’t seen it, Cake Boss is a hilarious documentary about the larger than life (quite literally) Buddy Valastro and his New Jersey family bakery. Think The Sopranos with bigger bellies, fewer guns, more rolling pins and even more drama. They produce these incredible multi-tiered, mega-complex cakes – life size animals, volcanoes with lava flowing out, treasure chests, tables of pretend food and, the best episode I’ve seen yet, the whole set of Sesame Street complete with the complete cast of characters made from cocoform. Otherwise known as modelling chocolate, which is 100% more fun to say in a Noo Joysey accent. 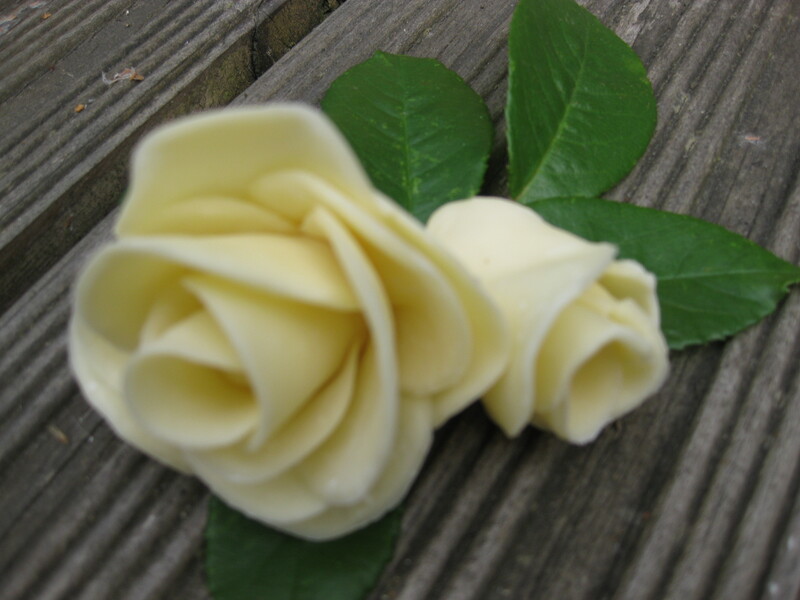 About the same time as I’d decided that cocoform, or modelling chocolate, was the way to go with my flowers, I read a post by The Pink Whisk (otherwise known as baking blogger extraordinaire Ruth Clemens) about how to make sugar roses. I sent her a note to see if I could use the same method with my chocolate versions. 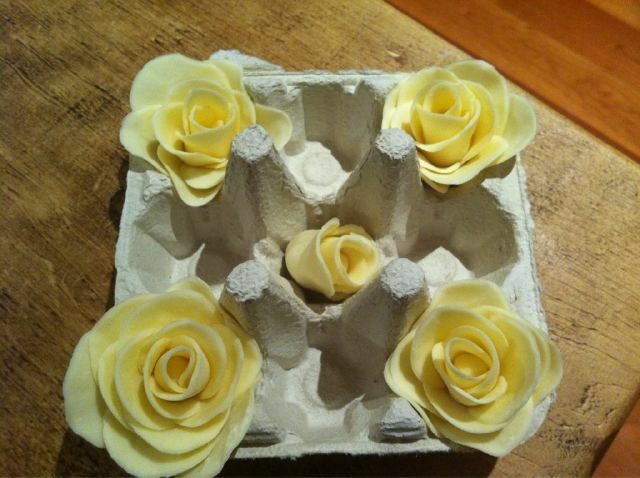 It wasn’t quite the same technique, but pretty similar, so last night I set about making my roses. These flowers are based on some sound advice from The Pink Whisk here, and also a great tutorial I found on Cake on the Brain, here. I won’t bother to repeat the process as they do a much better job, and Cakebrain even illustrates the process with beautiful photos. I’m pretty pleased with my first attempt at roses, and her post has received over 60 comments to date, so she must be doing something right. These roses took about 20 minutes to make from opening the packet of cocoform, so really not a major effort in the grand scheme of things. I hope Josceline would be proud. Final note: I bought my modelling chocolate from Squires Kitchen. The packs cost a whopping £4.99 for 150g but I understand you can achieve the same plasticky effect by melting plain chocolate with corn syrup. Definitely one to try next time. Your roses are beautifully impressive. I’d be impressed with myself for doing chocolate leaves. I keep hearing these are easy, but I suspect they’re not as easy as all that. ps love the look of your Chocolate & Lime Curd sponge!